H2A rocket launch from Tanegashima Space Center with onboard the following satellites that will be operating in the Amateur radio frequency spectrum. 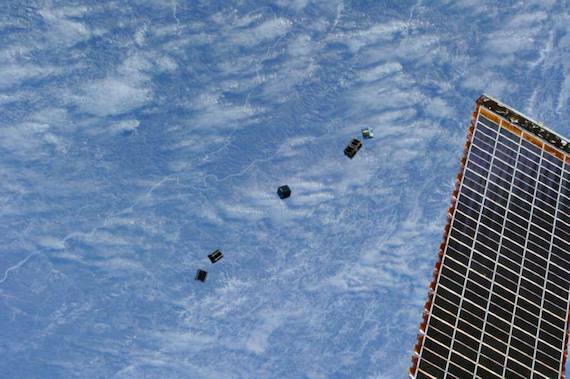 5 cubsats launched from the International Space Stations. Update: The launch date has changed. 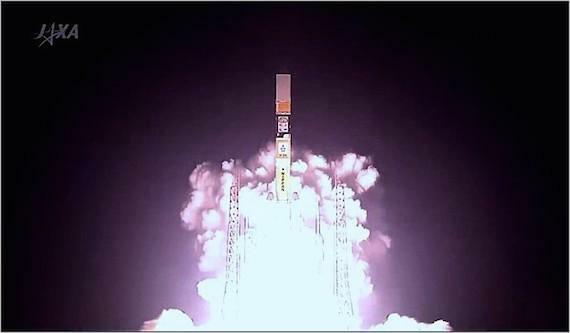 Now the satellites will be launch at the 19th and 20th of November 2013. With al the attention going towards the Dnepr launch on November 21 we would almost forget that there are a couple of Cubesats onboard the ISS that will be launched also. The launch is planned for November 25. The following satellites will be deployed. Pico Dragon, developed by the Việtnam National Satellite Center (VNSC), University of Tokyo and IHI aerospace. A CW beacon at 437.250 MHz and 1200 bps AFSK AX.25 telemetry on 437.365 MHz. 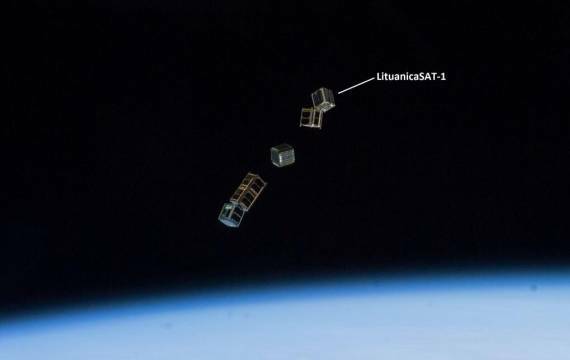 ArduSat-1 developed by NanoSatisfi. 437.325 MHz 9k6 MSK CCSDS downlink. ArduSat-X developed by NanoSatisfi. 437.345 MHz 9k6 MSK CCSDS downlink. TechEdSat-3 developed by interns at the NASA Ames Research Center. 437.465 MHz 1200 bps packet radio beacon transmitting 1 watt to 1/4 wave monopole. It plans to test an Iridium Satphone modem and has a deployment mechanism to de-orbit in 10 days. 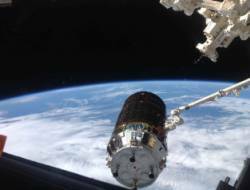 These satellites arrived Aug 9, 2013 at the International Space Station’s and the Canadarm2 grapples the unpiloted Japanese “Kounotori” H2 Transfer Vehicle-4 (HTV-4) as it approaches the station, carrying ArduSat-1 and ArduSat-X among 3.6 tons of science experiments. 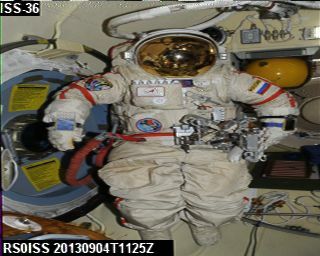 It is been a while for me, but today I had some pretty good SSTV reception from ISS on 145.800, the SSTV mode was martin1. 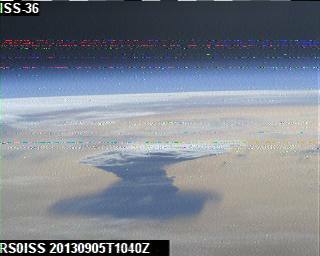 For decoding SSTV data I use MMSSTV. The transmissions started late in the pass and I think it has to do with the fact that our Italian astronaut is taking in consideration his radio friends in Italy. I was a little premature with this comment and IK1SLD gave the right information. He wrote to me via the AMSAT-BB mailing list the following. Luca Parmitano doesn’t use the Kenwood TM-D710, this radio is used by Russian crew. The MAI-75 Experiment is a Russian experiment and the crew activates it when Moscow has AOS, so we lost 50% of the pass. Luca only use the Ericsson radio in the Columbus module. Thank you Claudio (IK1SLD) for this update. During the second day of the MAI-75 Experiment I could only receive and decode one image. It seems there where some problems with the radio because there was a carrier but no data being transmitted. 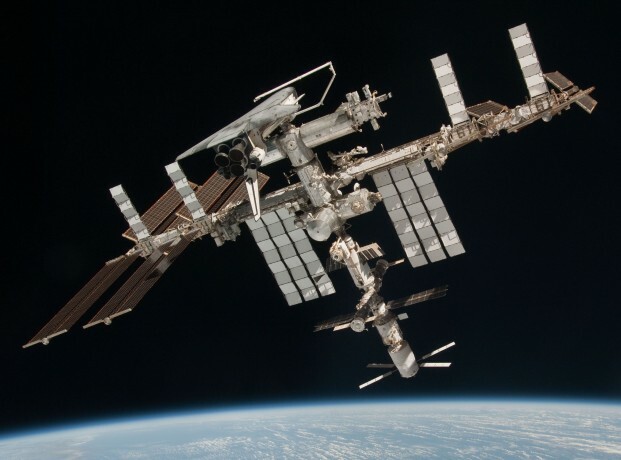 The International Space Station school contact with participants at Lycee Polyvalent Anatole France, Lillers, France, first planned for March 4, has been re-scheduled to Saturday March 9, 2013. The event is to begin at approximately 11:42 UTC, which is 12:42 CEST. 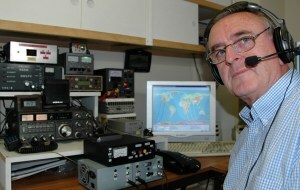 The contact will be a direct radio contact operated by F4KIS. Interested parties in Europe are invited to listen to dowlink signals on 145.800 MHz FM. The contact will be conducted in English. Space plasma experiment “Shadow” onboard International Space Station (ISS) with participation of radio amateurs. Many space professionals are looking forward to further space exploration using electric thrusters (ET). Unlike ordinary chemical propulsion systems, ET demonstrate much more higher exhaust velocity, since the propellant is accelerated for propulsion by electric power being supplied from an onboard source. The thrust produced by ET is very small – not more then a few grams so that ET cannot burst a rocket from the Earth surface. ET can tick only on board any orbiting satellite or spaceship. Currently we are present at the beginning of the “gold century” of electric propulsion. To make it reality the electric propulsion community in many countries is going on with research and development of ET of different types either for secondary on-orbit application or for primary propulsion of multikilowatt level. However what is a place of radio amateurs in the matter – an impatient reader could ask. Do not be in a hurry, dear reader, do not put reading this article off and you in a few minutes realize that the VHF-community could play its role in ET implementation if wants. Integration of ET with onboard equipment poses a certain set of problems to be solved such as electromagnetic compatibility of ET. Particularly the matter is that highly ionized exhaust plumes of ET may scatter RF-signals producing large “dead” zone for communications. In 1987 specialists of Central Research Institute of Machine Building (TSNIIMASH) conducted a series of space plasma experiments in order to evaluate the shape of mentioned above “dead” zone using KOSMOS satellites with onboard arcjet plasma source. Methodologically SpEx “Shadow” is oriented to using of amateur packet radio and Internet technology and resources. SpEx “Shadow” lay out is shown in Fig.1. In the chosen region the onboard arcjet source injects a plasma plume in space and the onboard radio beacon transmits VHF sounding signals in the form of the Universal Time marks. Passed through the plasma these signals are being instantly received by an on-ground measuring VHF network. Due to refraction/scattering of the sounding signals in the exhaust plume, the shadow region would arise adjacent to the satellite. When the shadow boundary running after the satellite along the Earth surface reaches any on-ground receiving site the signal cut-off is to be registered. The task of every individual participant is to register moments of signal cut-off and following signal restore using the Universal Time marks and to address this information along with data on its geographical position to the Information Storing Center. Every operation sequence would take 6-8 min. while the satellite is passing between two opposite points of the local radio horizon. It is interesting to perform the experiment in different geophysical conditions. The amateur packet radio technology in the SpEx “Shadow” as proposed by astronaut Alexander Kalery, offers the possibility to use Internet transport resources either for net-work notification or for data collection. Principally the available receiving network may be provided with Universal Time Marks if the onboard radio beacon merely transmits packets of minimal duration in format of AX25 Protocol. The same technology can be also applied in space experiment on sounding of not artificially injected plasma, but of the natural ionospheric plasma in HF frequency band (14 MHz). 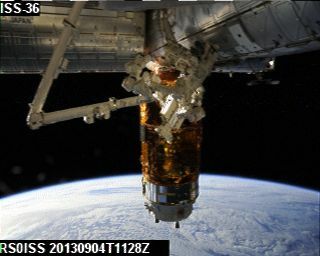 It is expected, that due to dispersion of sounding radiation in ionospheric plasma, an “irradiated” spot should appear on the Earth surface, and determination of boundaries of this “irradiated” spot is the purpose of space experiment (legend “Spot”), which can be carried out not necessarily on the ISS. The scientific results the SpEx “Shadow” will help designers of future electrically propelled spacecrafts to minimize the hazard of communication disruption by ET plasma plumes. Except the scientific issues, realization of the space experiment “Shadow” will give an unique experience in involving of intellectual and technical potential of International radio amateur community as well as Internet technology and resources for monitoring of the near-Earth space and to evaluate capability to use this potential in perspective scientific projects. Actually the space experiment “Shadow” is an interesting attempt to use Internet for principally new goal – not only for information spreading but also as an effective measuring tool in spatially large-scale scientific researches. The space experiment “Shadow” may also bring an important social result attracting public attention to advanced technology, astronautics, amateur packet radio and Internet. As it was mentioned above the space experiment “Shadow” may be successfully performed under the condition that the number of participants will be great enough . The greater this number the more precise scientific result would be issued. As claims for participation in the SpEx “Shadow” appear at the Information Storing Center in response to this initial invitation, we are going to select perspective “measuring fields” where the receiving network is dense enough and where the bulk of activity will be further concentrated. of full scale “hot” (with plasma injection) experiments. After successful fulfillment of the “cold” phase it will be possible to accept the justified solution on realization of a series of full scale “hot” experiments later. Every participant of the space experiment “Shadow-beacon” will be awarded with special certificate. It is understood that the ISS amateur radio SpEx Shadow-Beacon experiment is planned to take place February 1-3 and 8-10. The timetable is here. The Central Research Institute of Machine Building (TSNIIMASH) in Russia is conducting a series of space plasma experiments in order to evaluate the shape of previously observed “dead” zone, or shadowing due to the firing of an onboard arcjet plasma source. 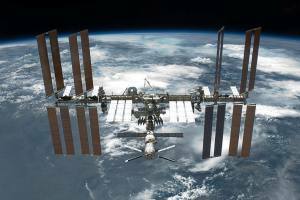 Radio Amateurs are invited to participate in the Space plasma experiment “Shadow” onboard the International Space Station (ISS). Integration of Electric Thrust (ET) onboard a spacecraft poses a certain set of problems including electromagnetic compatibility of ET. One matter of interest is that highly ionized exhaust plumes of ET may scatter RF-signals producing large “dead” zone for communications. This plasma screening effect should be thoroughly studied before electric thrusters become standard onboard equipment. The investigation will help designers of future electrically propelled spacecraft to minimize the hazard of communication disruption by ET plasma plumes. The experiment will use the ISS Amateur Radio 145.825 MHz FM AX.25 1200 bps packet radio downlink. 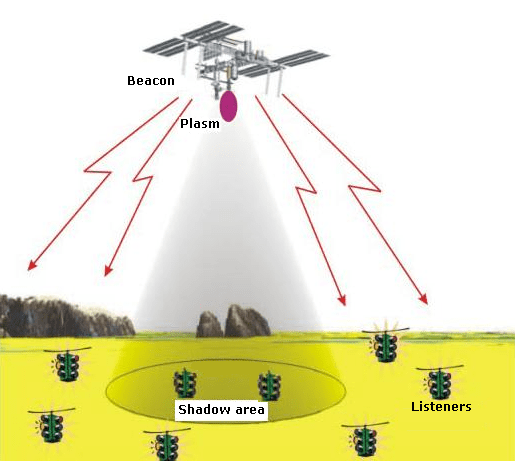 The amateur packet radio technology in the SpEx “Shadow” as proposed by astronaut and radio amateur Alexander Kaleri, U8MIR, uses the AX25 packets transmitted by “Master Stations” and reported by receiving amateur radio ground stations to track the effect of the plasma shadow.